Please join us for our “Love is in the League” fundraiser at Dillard’s. The event will be held ‪Feb. 7-9. From Feb. 7-8, Dillard’s will be donating $2 for every bra fitting, plus and additional $2 from any lingerie sales. Then join us on Satuday, Feb. 9 for the Dior Master Class‬! 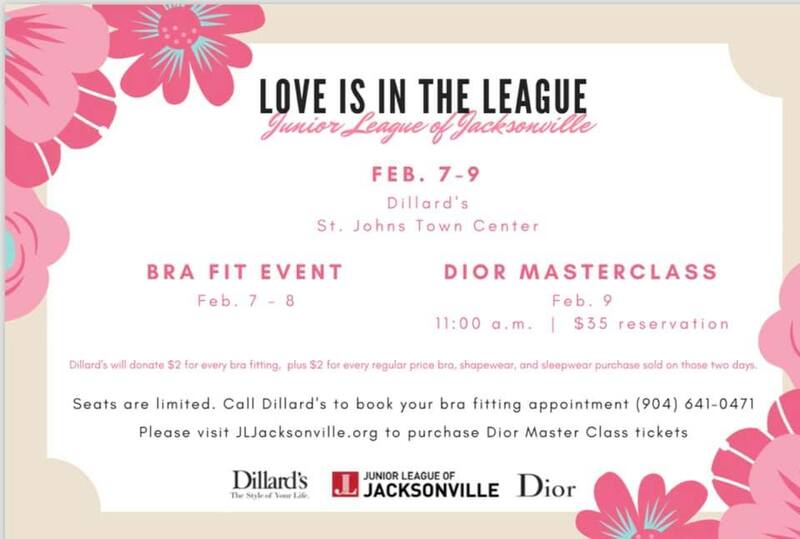 The cost of the event is $35 with $10 of that going directly to the Junior League of Jacksonville (JLJ) and the other $25 as a Dillard’s gift card purchase to be used in any department of the store. Any purchases from the Dior make-up counter or the Lingerie department will provide a 10% donation to JLJ. Your donation of $35 includes access to the Dior Master Class, involving a free make-up makeover and an 1:1 consultation with a professional Christian Dior MUA, entry into a raffle for a Dillard’s lingerie set valued at $400, swag bags, intimates fashion show, a mini brunch and a bra fitting instructional class with one of Dillards’s intimate specialists. This is an event you don’t want to miss!! !